For many, 2016 was simply a year to forget. Riddled with the passing of iconic celebrities, continued tensions in the Middle East, and, of course, the election of business magnate and always-controversial Donald Trump, this year has done more to dishearten and divide the American public since “Dressgate”. However, if sports are your passion, 2016 was nothing short of fascinating. Across the country, this year’s sports cycle brought fans a year of “firsts”. The Chicago Cubs finally put to an end the infamous “Curse of the Billy Goat”, defeating the Cleveland Indians for their first World Series championship since 1908. The Cleveland Browns, rivaling standards of mediocrity with the 2008 Detroit Lions, staved away infamy with their first nail-biting win of the season over the San Diego Chargers. And, much to the amusement of Wolverine fans across the globe, the Michigan State Spartans posted their first losing record since 2009, winning only three games and sending legions of Spartan faithful out of their stadium and back to their homes to wallow in self-pity. Unfortunately, sports in 2016 have been dominated by controversies of a different sort — officiating mistakes. Aside from the replacement officials controversy swallowing the NFL whole in 2012, I cannot recall another time where such heavy scrutiny alongside downright awful officiating by referees has dominated sports media. It seems every week I read an article with the same eerily-familiar title: “League admits call ‘X’ was wrong”. In all fairness, poor officiating is by no means a new problem. In previous years, contentious calls have always been a component of both professional and collegiate athletics. From missed penalties in the Detroit Lions wild-card matchup against the Dallas Cowboys last season, to numerous scandals plaguing the 2016 NBA playoffs, and even a controversial call giving massive underdog Central Michigan a hail mary victory over the ranked Oklahoma State Cowboys, poor officiating has been engrained as simply another part of the game. It’s gotten so bad that some fans are beginning to believe the sports they know and love are rigged against them. Who can blame them? This year alone, questionable calls have had dramatic impacts on the outcome of a game, in more instances than one. During the NBA’s marquee Finals rematch between the Cavaliers and Warriors on Christmas Day, discrepancies in technical foul calls against LeBron James and Draymond Green–amongst other disputable calls–drew the ire of fans across the league. In effect, NBA officials punished Green for merely walking to the bench, albeit shouting quite a bit, while James received no such punishment for treating the rim like a jungle gym. In the NFL, the Detroit Lions faced the wrath of the refs yet again, falling victim to another series of poor and missed calls in their recent rematch against the Dallas Cowboys. To their credit, the Cowboys would end up winning by a convincing twenty-one points, rendering these calls irrelevant; regardless, Lions fans still felt justifiably cheated after the matchup. Finally, and most painful of all for fans in Ann Arbor, the already-infamous 4th down call during this year’s matchup between Michigan and Ohio State added more fuel to the firestorm of disputable officiating. While we may never know for sure if J.T. Barrett actually reached the line to gain, fans refused to leave the question unanswered. The call drew in self-organized over analysis from across the Internet, going as far as examining a pixel-by-pixel frame of the play and even appealing to the expertise of a Wayne State University nuclear physicist. Looking at some of the most controversial and downright baffling calls of the year, it’s clear that officiating standards need to change, and quick. 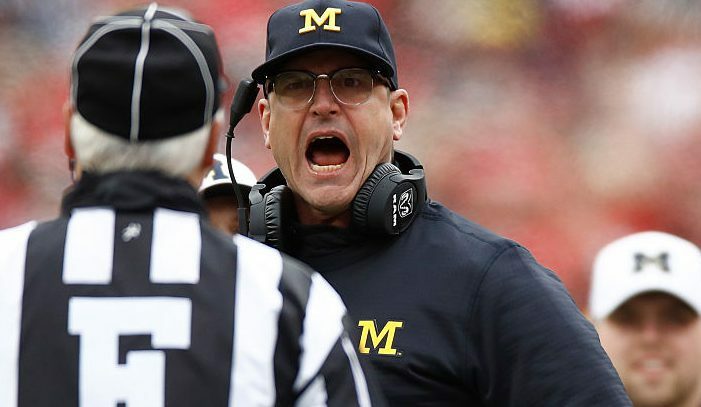 First and foremost, poor officiating unfairly and often negatively impacts a team’s season-long hopes of reaching the Playoffs, as was the case for Michigan Football this season. Teams expect the rules to be carried out fairly and correctly. When this simple tenet of officiating fails, a season’s worth of hard work and effort is marginalized behind the effects of one god-awful call. Furthermore, officiating sets standards for how teams can and cannot compete. In theory, it should punish boisterous players for dirty and unfair play, while rewarding those who comply with the rules. When these rules are poorly enforced, the aforementioned “dirty” players are rewarded for their play, while those following the rules are punished. It’s this form of double standard proliferated by poor officiating that disenfranchises fans, coaches and players alike. It can even be dangerous. Targeting, a new rule implemented by both the NCAA and NFL, works to make the sport safer by punishing head-to-head collisions that can cause serious injury, even potentially ending an athlete’s career. However, as the NFL season began, fans noticed multiple clear targeting calls being downright ignored, concerning both fans and players. Cam Newton, quarterback for the Carolina Panthers, has been a vocal critic of such oversights by NFL officials this season, being on the receiving end of multiple missed calls throughout multiple contests this season. His complaints should not fall upon deaf ears; if officiating of such poor quality persists, people can and will get hurt. To the credit of officials across the globe, being a referee is quite an arduous undertaking. In addition to understanding the intricacies of the rules and dealing with unruly players, referees must also balance the responsibility of making the correct call with the stress and anxiety of handing disappointed fans who may not agree with your decision. Furthermore, it’s easy for legions of armchair quarterbacks to blindly criticize officials, primarily due to new camera angles fans are afforded. In the NFL, there are a minimum of fifteen cameras pointed at the field, including skycams and new cameras in the endzone pylons, giving fans nearly every view of the field imaginable. Counter that with an officiating crew with only seven members who all share a similar field-level view, and it might be easier to understand why every official makes a mistake now and again. Going forward, both professional and collegiate athletic associations must renew their commitment to quality officiating standards. The NFL has already gotten the ball rolling, using a live-camera oversight system in New York alongside officials who do a fantastic job of explaining complicated calls on the field. However, more must be done. Expanding the list of reviewable calls, increasing standards for those who apply to be officials, and increasing the use of multiple camera angles on the field for officials to consult can all be beneficial in improving officiating standards. Enacting such changes leads to more accurate calls, protects player safety, and minimizes dirty play. As 2016 draws to a close, officials in the New Year must be held accountable for maintaining the quality and consistency of the sports they oversee. The legitimacy of a game’s result hinges upon proper officiating. Right now, fans aren’t receiving that sense of legitimacy, instead witnessing a sports climate dominated by accusations of fixed games, league-wide scandal, and declining viewership. Let us hope sports organizations across the globe invest in quality officiating to kick off 2017. If they don’t, there may not be any fans left to complain. What will happen to you in 2017? And are you willing to sell your soul to advertisers in order to find out?